Yesterday the Wyofile, a website dedicated to reporting on Wyoming reported that U.S. Federal Judge Nancy Freudenthal ruled against an Interior Department’s 2010 guidelines on categorical exclusions. These guildelines were put in place to curtail the use of “categorical exclusions” in permitting oil and gas drilling. The plaintiff, industry trade group Western Energy Alliance, successfully argued that the guidance was invalid, in part, because it wasn’t created under a formal process that includes public comment. Yet the “categorical exclusion” itself is a procedural tool that allows industry to bypass — at the permitting stage — a formal National Environmental Protection Act (NEPA) analysis that includes public comment. I gladly admit that I don’t fully understand the legal ins and outs of this argument. What I do understand is that the courts are beginning to undo some of the power grabs put in place by some of the more radical environmentalists in the Obama Administration. Because of the environmental agenda, a lot of America’s natural energy resources are being ignored while we continue our dependence on foreign sources with governments that use the money to wage war against us. That is not a good thing, but I believe it is slowly changing. I am sure this is one of many battles to come. Where Can I Get A Job Like That ? As most Americans are counting their pennies as they plan their family vacations this summer, they are financing a Hawaian vacation for a fortunate bunch of Congressional staffers. The entire press staff of the Senate Indian Affairs Committee is in Maui, even though a field hearing there won’t happen until next Wednesday. Your tax dollars at work. The hearings will be held there because Hawaii is the home of Senator Daniel Akaka, who is the committee chairman. It is unclear whether the committee will deal with any issues related to Hawaii. The Democratic committee staffers used taxpayer funding to travel to Hawaii a full week before their committee’s hearing date. When The DC called the committee’s Washington, D.C., office Thursday afternoon, a different staffer who answered the phone said all the committee’s communications staffers are already in Maui. And we wonder why we have a deficit? Reuters is reporting that the Appeals Court for the11th Circuit, based in Atlanta, ruled today that the individual mandate, the funding mechanism for Obamacare, is unconstitutional. This is the last step before the case goes before the United States Supreme Court. The question at the bottom of this case is simple, “Can the government force you to buy something you may not want to buy?” I think that the answer to this question is common sense, but our courts are not always known for common sense. The individual mandate was going to be the money source for Obamacare–if everyone is forced to buy insurance, the risk pool is larger, and theoretically, the individual cost goes down. On paper, this means that everyone has a primary care physician and the lines at the emergency rooms are made up of people there only for an emergency, and thus the lines are shorter. This was part of the plan in Massachusetts, and the lines at the emergency room are still as long as they were before we had Romneycare. Plus the cost of our health insurance in Massachusetts has risen faster than the rest of the country, and some insurance companies are not providing the coverage they provided before Romneycare. Our state health insurance has gotten more expensive with less coverage under Romneycare. I have no reason to believe Obamacare on a national level would be any different. On a personal note, I just paid over $3,000 out of pocket for cataract surgery and the appropriate lens–and I have good health insurance! Anyway, stay tuned. It will be a while before this is decided. The thing to keep in mind here is that this is a race against the clock. The mechanisms of Obamacare will begin to kick in in the next two years. The increased taxes for Obamacare will begin to impact the average American in January 2013–right after the 2012 election. If Obamacare is not stopped within the next year, stopping it may be moot. We need to do this as soon as possible. There are two ways to stop Obamacare–the courts, which are not always dependable, and the 2012 election, which may or not be dependable. I just hope one of them works in time. ABC News at WTVD-TV, serving Raleigh-Durham, North Carolina, reported yesterday that four Wake County residents have been charged with voter fraud for voting twice in the last presidential election. According to arrest warrants, Leache filed a no-excuse absentee application on Oct. 29, 2008, as well as voted at the polling place on Martin Luther King Boulevard in Raleigh on Nov. 4. Leache later admitted to authorities that she did vote twice in the presidential election. Hodges and McLean – who also is facing unrelated charges from this past June – both each participated in early voting at Chavis Heights Community Center in Raleigh and later voted on Election Day at their local fire department polling place, according to court documents. They also admitted to the charges. A fourth person, 54-year-old Lela Devonetta Murray of Edwards Mill Road in Raleigh, was also charged with voter registration fraud. This incident underscores the need for better checking of voters during an election. It also shows the dangers of early voting. The fraud was discovered because someone investigated, but we should be able to check our voting records a lot sooner than these records were checked. We need voter identification laws that protect the concept of one man, one vote. Anything else cancels the votes of those of us who only vote once. President Obama is pushing for further extension of unemployment benefits currently maxing out at 99 weeks–that’s almost two years. I don’t even know where to start. I might mention an article at rightwinggranny from May of last year. I doubt that extending unemployment for more than two years creates jobs–between human nature and the fact that people on unemployment spend their money on necessities–they generally don’t have the extra money to stimulate the economy. We don’t need to extend unemployment, we need to get the government off the back of the private sector so that businesses can create jobs. The idea that the Obama Administration believes that extending unemployment creates jobs is simply amazing. They don’t understand economics and they don’t understand human nature. After years of extensive lobbying for federal dollars, a 1987 public works bill appropriating funding for Boston’s Big Dig was passed by U. S. Congress, but it was subsequently vetoed by President Ronald Reagan as being too expensive. When Congress overrode his veto, the project had its green light and ground was first broken in 1991. The project was declared completed on December 31, 2007, when the partnership between the program manager and the Massachusetts Turnpike Authority ended. The Big Dig cost three times what the Panama Canal cost and was paid for by federal dollars–all Americans paid for it. I apologize on behalf of the people of Massachusetts–not only were we ripped off, we ripped off the rest of America. I would be the first person to say that Boston is cold, but even I am willing to admit that it thaws occasionally. “The state expects to spend at least $15 million to repair the problem by drilling the area and filling it with concrete, once the ground finishes settling by 2014. It already has spent $1.2 million on a new pumping system after a tunnel ramp’s sagging, 345-foot drainage pipe was damaged after sinking 8 feet. I have no answers for this. It does seem to me that someone should be held responsible. My first concern is the safety of the tunnel and of the commuter rail, but my second reaction is anger at a job done so poorly. The Big Dig was originally scheduled to be completed in 1998 at an estimated cost of $2.8 billion. It was completed nine years later at a cost of $22 billion (this includes the $7 billion in interest payments). The Big Dig is one of the best arguments I can think of against government highway projects. I wonder if private contractors could have worked together to do this project–they probably could have done it less expensively and more safely. Right now, I am convinced that the Big Dig is a $22 billion unsafe boondoggle. I grew up in a very different time. I remember when the first television came into the house. I didn’t find out that Rocky and Bullwinkle were in color until after I got married–when my husband and I bought our first color television set! My children were raised with Sesame Street in its early days. I still wonder about whether or not the very short segments contribute to ADD or ADHD, but since only one of my three children has the disorder, I tend to believe it is more genetic than Sesame Street related. At any rate, I enjoyed Sesame Street and still watch it occasionally with my grandchildren. On Tuesday the New York Daily News reported that there is an online campaign to have lovable roommates Bert and Ernie get married. “More than 700 people have signed on to the petition, posted at change.org. Sesame Street is a show designed for pre-schoolers. They do not need to know or care about exactly what the relationship between Bert and Ernie is. “But the producers of Sesame Street say Bert and Ernie’s relationship is purely platonic. “”Bert and Ernie are best friends,” the non-profit Sesame Workshop said in a statement. “They were created to teach preschoolers that people can be good friends with those who are very different from themselves. The producers have it right. I hope they are able to stand their ground. Everyone is entitled to their own opinion on homosexual marriage, but small children do not need to be exposed to the controversy–they are children. I like what the producers said about Bert and Ernie–they are there to teach that it’s okay to be friends with people who are different. That is a really good message that does not need to be complicated with controversy. There are two sides to every story–in this case one side is told by the Washington Examiner yesterday and one side is told by the New York Times yesterday. The story itself is the recall elections in Wisconsin. The New York Times states that the fact that two Republicans were successfully recalled is a warning to ‘union busters’ that there is a price on their activities. Well, that is an interesting premise, but the facts don’t back it up. I don’t mean to be cynical here, but I think if your wife leads the recall effort, you might have a problem. Somehow the New York Times article omitted these facts. I am thrilled to know that the unions could not buy this election. I would like to publicly state that I am not a corporate interest. I am opposed to what unions have done to local governments because I am watching cities and towns struggle to pay their bills due to increasing pressure from unions to raise wages and benefits above those in the private sector. Central Falls, Rhode Island, has recently gone bankrupt due to unfunded liabilities involving pensions and medical insurance for union members. No one is trying to break the unions, they are simply trying to bring union demands into line with fiscal responsibility so that both municipal governments and unions can survive. Can We Get A Refund ? On Monday the Daily Caller ran an article about the estimate from the Congressional Budget Committee on the cost of Obamacare. The problem with the Congressional Budget Committee is that their estimates of the cost of a program are based only on the information and figures they are given. They can only estimate cost on the information they are given. It has recently come to light that because they were not given complete information, the Congressional Budget Office underestimated the cost of Obamacare as much as $50 billion per year because they were not given an accurate picture of how the program would work.. Since many people have families covered under their healthcare programs, that is an important fact. “But companies and their employees share great incentives to rearrange workers’ compensation to win more of these federal subsidies, he said. “For example, he explained, an employee can ask his employer to raise the price of company-provided insurance in exchange for an equal increase in salary. In many cases, that would boost the share of his income spent on health insurance to a percentage above the 9.5 percent threshold. “Such an arrangement, Burkhauser (Richard Burkhauser an economist who teaches in Cornell University’s department of policy analysis and management) added, would make the employee, his spouse, and his children all eligible for federal health care subsidies while enriching both employer and employee — even after the Treasury Department collects fines from U.S. workers. The problem here is that when you offer some people a free lunch, everyone wants one. That is human nature, and until the government stops handing out free lunches, government spending will continue to spiral out of control. Today’s Washington Examiner is reporting that the Republicans have held control of the Wisconsin Senate–losing only two seats in the recall election. Considering the amount of money the unions invested in this election, that is very good news. There is a recall election of the Democrats in the Senate next week. None of the Democrats are expected to be recalled, but the Republicans will still maintain control of the Senate. As a result of the policies that Governor Walker instituted, the unemployment rate in Wisconsin has been around 7.4 to 7.6 percent since the beginning of the year. In June, 9,500 new jobs were added in the state. The monopoly of the Wisconsin Education Association Trust on health insurance for teachers has been broken and the result is more money to spend on actually educating children. The Kaukauna School Board has already stated that changes in the health insurance bargaining will result in smaller class sizes. Racine County has been able to use jail inmates for landscaping that had been neglected due to budget cuts–something the unions had previously prevented them from doing. Over the weekend I met someone from Wisconsin who was not happy with the changes that have been made. I wonder how much of the good news is getting past the media filter in Wisconsin. Evidently enough voters understood the need to break the union control over their state budget to get the job done. I hope the trend continues. Today’s Daily Caller posted an article about some of the inaccuracies in a Sunday Washington Post article about the recent debt ceiling showdown. The article states that House Majority Leader Eric Cantor, Majority Whip Kevin McCarthy and budget committee chairman Paul Ryan laid the foundation for this crisis years ago in order to improve the fortunes of the Republican party. Good grief. These people should be writing for Hollywood, they’d probably do a good job! I think if you want to examine the debt ceiling debate you have to look at the Tea Party. First of all, it is important to distinguish between the Tea Party Express and the Tea Party Patriots. The Tea Party Express is a Political Action Committee founded in California in 2009. It is structured, organized, supports candidates, etc. The Tea Party Patriots is a very loosely organized group that holds rallies, supports issues, and generally stands for small government. The Tea Party Patriots had a lot to do with Republican victories in 2010, but they are not in any way connected to the Republican party–in fact, I suspect that many establishment Republicans wish they would go away. One of the comments I heard during the debt ceiling debate was the consternation of a politician who complained that the new Tea Party congressional members were a problem because they couldn’t be bought! Hallelujah! He was referring to the fact that the kind of earmarks that had been thrown into Obamacare at the last minute to pass it simply did not work on the Tea Party Republicans. House Majority Leader Eric Cantor, Majority Whip Kevin McCarthy and budget committee chairman Paul Ryan are fortunate enough to be men who are in the right place at the right time with the right idea. I suspect that there are many establishment Republicans who wish that these men would go away, but the fact is that Cantor, McCarthy, and Ryan better represent the American people than the establishment Republicans. The Republican Party has a choice to make. If they make the wrong choice, they are in danger of becoming a third party. The establishment Republican Party will simply be replaced by the Tea Party. What has happened is very simple. As people get older and retire, they have more time to pay attention to what their government is doing. When you are young, the major part of your energy is taken up with raising your family, working, etc. Generally speaking, politics is not part of the picture. When Obamacare was passed, a button was pushed in the minds of the country’s senior citizens. They saw the cuts to Medicare and the death panels (even though the death panels are still being denied, they are there) and decided to take a stand. Right now the Republican Party is benefiting from the energy of the Tea Party, but unless the establishment Republicans get serious about shrinking government, that may not continue. Anyway, the debt ceiling showdown was a natural outcropping of Americans concerned about the size of government. It would have been nice if the Republicans had planned the whole thing, but frankly, I am not sure they are that smart. Yesterday’s Washington Times posted an article about the Canada-to-Texas oil pipeline that would could carry as many as 1.1 million barrels of oil a day from the oil sands of Alberta to Gulf Coast refineries. The pipeline has been delayed because of environmentalists. There are a few things to be looked at here. The environmentalists have stated their concern that the pipeline will leak, so they are opposed to it. If the pipe leaks, we have the technology to fix it. Importing more oil from Canada is a great idea. Building the pipeline would be expected to add 20,000 jobs to the American labor force–a really good idea with unemployment hovering around 9 percent. Increasing our oil imports from Canada would decrease our oil imports from the Middle East. It would decrease the amount of money we give to Middle Eastern governments that fund the terrorists we are fighting. Buying more oil from Canada would be a step toward ending the schizophrenia in our current energy policies. “The third phase has been hung up since September 2008, when the company applied a second time to build the extensions, known as Keystone XL, to the north and the south, so that oil from Alberta could be transported to Texas. “After nearly three years, the application has yet to be approved or denied. If the Obama administration gives them the go-ahead, the full pipeline could be operational by mid-2013, the company said. The article also comments that the tar sands oil is not as clean as the oil that comes from the Middle East. I suspect that problem could be solved with some scientific innovation in the refining technique. At any rate, it is time for America to develop its own energy resources–ANWR, offshore, shale, etc. We need to stop supporting the terrorists who wish to do us harm. This is a picture from the Worcester Massachusetts Tea Party Rally in April of last year. Do these people look like terrorists? Thanks to the media spin machine, 29 percent of voters now believe that the Tea Party are terrorists. The Daily Caller posted a story about the numbers today. 29 percent of those polled agreed with that statement. That is almost one out of every three people asked. As the media continues its attack, that number may rise. There is no hope for the future of our republic without an informed electorate. Unfortunately, the mainstream media is doing everything it can to create a misinformed electorate. Yesterday the Canada Free Press posted an article entitled, “We Don’t Need No Stinkin’ Facts.” It’s about believing facts or feelings. The article cites a cable television show called “Bulls**t!” that occasionally airs on Showtime. The show takes ideas that are generally accepted and exposes the fraud in many of them. One example of this (I don’t know whether it is from the show or not) is a YouTube video of Penn and Teller collecting signatures from people on a peititon to ban water (by calling it dihydrogen monoxide). The article goes on to detail a show that was done about organic produce. By the end of the show, it was demonstrated that organic and non-organic products are not always easy to tell apart and that organic does not necessarily mean better. “But it gets even better. In one hilarious segment, the presenter cut a banana in half, told people one half was organic and asked people which half tasted better. It’s time to admit spending is the problem, and deal with it. 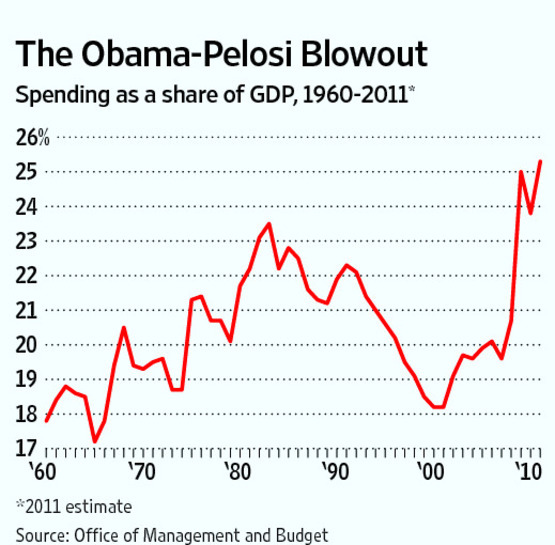 The debt ceiling was a rather feeble start, but it was a start. It is now time to get serious about budget cuts. That is the only way out. Today The Australian reported on a plan to bring water to the deserts of the world. French engineer Georges Mougin has tried for 40 years to sell his idea of using icebergs to bring water to desert areas. Now that a computer simulation has shown that the idea is possible, he is looking for people to back his efforts. Unscientific person that I am, I did not realize that icebergs are fresh water. This is an interesting idea. The article describes the simulation and the problems it revealed. It is a fascinating idea. Please follow the link and read the entire article. No, that was not a typing error–there is some good news from Washington. Washington, D.C. – This week Representatives Jon Runyan (NJ-3), Walter Jones (NC-3), and Ileana Ros-Lehtinen (FL-18) introduced the “Saving Fishing Jobs Act of 2011.” This legislation seeks to hold the National Oceanic and Atmospheric Administration (NOAA) accountable for fisheries management programs called catch shares that have been detrimental to fishermen throughout the Eastern and Gulf Coasts. The bill would require the Secretary of Commerce to terminate a catch share program if it reduces the total number of fishermen in the program by 15 percent or more. It also would prevent the government from imposing new catch share programs on fishing communities that oppose them. It would do so by requiring consideration of new programs to be initiated only via a petition signed by at least 50 percent of fishermen in the fishery, and by requiring a two-thirds vote of fishermen for approval of new programs. Finally, the bill includes language to protect taxpayers from shouldering the extra costs associated with implementing and managing new catch share programs. Catch share programs have been controversial because many have resulted in the consolidation of fishing fleets, costing fishermen their jobs. According to NOAA, one of the largest fisheries in the northeastern U.S. lost almost 20 percent of its boats in the first year (2009-2010) after a major catch shares program was implemented across the entire region. The Saving Fishing Jobs Act of 2011 is limited to the New England, Mid-Atlantic, South Atlantic, and Gulf of Mexico fishery management councils. Below you can find quotes from Reps. Jon Runyan (NJ), Walter Jones (NC), Ileana Ros-Lehtinen (FL), Wenonah Hauter of Food & Water Watch, and Greg DiDomenico of Garden State Seafood Association. A friend of mine who is involved in restoring the rights of fishermen sent me the link to this article. This is fantastic news for those men and women who make thier living in the fishing industry. After I read the Press Release, I looked to see what I could learn about Representative Runyan. I was impressed. Representative Runyan was elected in 2010. Before running for Congress, he was a professional football player. During his time in the NFL Jon was known for his strong work ethic and tenacity on the field, as well as his commitment to community service off the field. He was involved in numerous charities and established a sound reputation as one of the most well-known humanitarians in the Philadelphia-South Jersey area. He worked with the NJ Special Olympics, USO, Leukemia-Lymphoma Society, the American Red Cross, the Cystic Fibrosis Foundation, and the Juvenile Diabetes Foundation and served as the Grand Marshall for the Armed Forces Freedom Ride. He also served on the Board of the Alzheimer’s Association of the Delaware Valley and hosted the “Score for the Cure” Golf Tournament benefiting prostate cancer research in New Jersey. We definitely need more men like Jon Runyan in Congress. The loss of members of SEAL Team 6 is a tragedy, but it is no more a tragedy than the loss of any other soldier. It is a shame that we announced that the people on the helicopter were from SEAL Team 6; that is information that encourages the Taliban. However, there are some other aspects of this crash that need to be looked at. It’s time to take a really good look at who we are working with and how much we let them know about exactly what our forces are doing. Meanwhile, please pray for the families involved. The Hill posted an article yesterday about the Republican plan to roll back and limit new federal regulations that are slowing job growth and causing people to lose their jobs. For example, The Hill reported on June 9 of this year that American Electric Power said that it will shut down five coal-fired power plants and spend billions of dollars to comply with a series of pending Environmental Protection Agency (EPA) regulations. The costs of complying with the regulations will result in an increase in electricity prices of 10 to 35 percent and cost 600 jobs, AEP said. Maybe this would be a good time to put some EPA regulations on hold until the job situation improves. These are pending regulations, but as far as I know, they are continuing forward. “(The Economic Policy Institute’s Isaac) Shapiro said that EPI studies show negligible costs to the economy from Obama’s regulations but massive benefits. One study found all the major implemented environmental regulations costing only $12 billion. “He said the focus on regulations “is being used as a cover for the lack of any pro-jobs agenda coming out of conservative circles.” He said the 2007-8 financial crisis shows that more regulations are needed in finance and housing and said the BP oil spill in the Gulf shows the damage that can result to the economy from weak environmental regulations. The issue will come to a head in September when the REINS ACT comes to the floor of the House. Regulations From the Executive in Need of Scrutiny Act of 2011 or the REINS Act – Rewrites provisions regarding congressional review of agency rulemaking to require congressional approval of major rules of the executive branch before they may take effect (currently, major rules take effect unless Congress passes and the President signs a joint resolution disapproving them). Defines “major rule” as any rule, including an interim final rule, that has resulted in or is likely to result in: (1) an annual effect on the economy of $100 million or more; (2) a major increase in costs or prices; or (3) significant adverse effects on competition, employment, investment, productivity, innovation, or U.S. competitiveness. Provides that if a joint resolution of approval of a major rule is not enacted by the end of 70 session days or legislative days after the agency proposing the rule submits its report on such rule to Congress, the rule shall be deemed not to be approved and shall not take effect. Permits a major rule to take effect for 90 calendar days without such approval if the President determines such rule is necessary because of an imminent threat to health or safety or other emergency, for the enforcement of criminal laws, for national security, or to implement an international trade agreement. Sets forth House and Senate procedures for joint resolutions approving major rules and disapproving non-major rules. If our nation is to survive, we are going to have to pry power out of Washington, D. C., one fight at a time. They are going to be nasty fights with a lot of things said that are not true. It is the reponsibility of all voters to say informed and do their own research. Good luck! Is Anyone In Washington Paying Attention ? Please note “provide for the common defence”–it’s important. Unfortunately, we seem to be overlooking a serious threat to our nation (other than our runaway spending). At the end of July, The Diplomat posted a news story about what is currently happening in China with their defense build up. It will be interesting to see how Japan feels about this build-up, and it could mean serious trouble for the area. This is not good news. We have not only overspent–40 percent of every dollar we spend is borrowed from the Chinese. We are funding the people who are planning to destroy us as a world naval power. Please follow the link above to read the rest of the article. The author of the article, Robert C. O’Brien, is the Managing Partner of Arent Fox Los Angeles. He served as a US Representative to the United Nations. He can be followed on Twitter @robertcobrien. I really am tired of listening to Democrats blame George Bush for the deficits. The facts do not support the accusation, but somehow a lot of the press has neglected to look closely at the accusation. Byron York posted a story at the Washington Examiner on Thursday detailing the actual facts. In 2003 the government collected $1.782 trillion in revenue. In 2004 the government collected $1.88 trillion in revenue. In 2005 the government collected $2.153 trillion in revenue. In 2006 the government collected $2.406 trillion in revenue. In 2007 the government collected $2.567 trillion in revenue. That doesn’t sound as if the tax cuts cost money. In January 2001 the debt was $5.7 trillion. In January 2005 the debt was $7.6 trillion. In January 2009 the debt was $10.6 trillion. Obviously the increase of $4.9 trillion over eight years is awful, but it pales in comparison to what President Obama has done in only two and a half hears. Our current debt is $14.4 trillion–an increase of almost $4 trillion in two and a half years. The Republicans overspent, but they only controlled Congress for four years. The rest of the time during the Bush administration, Congress was either controlled by the Democrats or split between the two parties. Just a side note on all of this. Bill Clinton did not create a budget surplus–he was fortunate enough to be in office while the tech bubble was forming. The increase in tax revenue during the Clinton administration was due to a large increase in capital gains tax income as people began to cash in on the tech bubble. Unfortunately, George Bush was president when the bubble popped, but he still managed to increase tax revenue with tax cuts. Will Class Warfare Work In The Tax Debate ? One of the blogs at the Daily Mail posted an article on Friday about taxing the rich. If you have listened to any Democrat say anything in the past week you have probably heard the words millionaires and billionaires, corporate jets, rich corporations, people who prospered in recent years, etc. That is is called class envy. It’s supposed to make you and I want to sock it to anyone who makes more money than we do. I fell for it once in the late 1980’s or early 1990’s. I thought it would be a good idea to put a small tax on luxury items because the rich could afford it. I then watched the unemployment rate rise because the people manufacturing and building the luxury items lost their jobs because the rich decided not to buy luxury items quite so frequently. Then the people in the service industries began losing their jobs because the people who made luxury items didn’t have the money to pay for the services offered by the service industries. People went out to dinner less, traveled less, etc. Then I watched the Democrats who had brokered the tax compromise with George H. W. Bush use the compromise against him in the election. That experience was part of my becoming a conservative. A report from the Internal Revenue Service found that the rich — 8,274 people with incomes of $10 million per year or more — earned a total of $240 billion in 2009. Even of you confiscated every dime they earned, you would barely have enough money to cover government spending for 24 days. Of course, about a quarter of that money already goes to the federal government for federal income. So make that 18 days. Another 227,000 people earned $1 million or more in 2009. Millionaires averaged taxes of 24.4% of their income — up from 23.1% in 2008. They, too, did not earn enough money to come anywhere close to covering the annual deficits that are $1.5 trillion a year. Individual tax collections totaled $1,175,422,000,000 in 2009 — or 15.4% of all income. Doubling federal income taxes for everyone would still leave us $400 billion or so shy of balancing the budget. The true discussion here is the role and size of the government. Traditionally, government spending has been about 18 to 20 percent of the Gross Domestic Product (GDP). Even when you raise taxes, revenues are about 18 percent of GDP. It should be obvious that if we continue to spend more than 18 percent of the GDP, our debt will grow. This is where we have been and where we are going. I think it is time to turn around. If you think there are not some people out there who are angry with Congress and politicians in general, read this. I received it in my email today. Alan Simpson, Senator from Wyoming , Co-Chair of Obama’s deficit commission, calls senior citizens the Greediest Generation as he compared “Social Security” to a Milk Cow with 310 million teats. Here’s a response in a letter from a unknown fellow in Montana … I think he is a little ticked off! He also tells it like it is ! 3 My Social Security payments, and those of millions of other Americans, were safely tucked away in an interest bearing account for decades until you political pukes decided to raid the account and give OUR money to a bunch of zero ambition losers in return for votes, thus bankrupting the system and turning Social Security into a Ponzi scheme that would have made Bernie Madoff proud. 5 I, and millions of other Americans, have been paying into Medicare from Day One, and now you morons propose to change the rules of the game.. Why? Because you idiots mismanaged other parts of the economy to such an extent that you need to steal money from Medicare to pay the bills..
To add insult to injury, you label us “greedy” for calling “b******t” on your incompetence. Well, Captain B******t, I have a few questions for YOU. proposing in your disgusting deficit reduction proposal, or, as usual, have you exempted yourself and your political cronies? nutcases who have bankrupted America and stolen the American dream from millions of loyal, patriotic taxpayers. And for what? Votes. That’s right, sir. You and yours have bankrupted America for the sole purpose of advancing your pathetic political careers. You know it, we know it, and you know that we know it. As the battle between Boeing Corporation, the unions, and the National Labor Relations Board (NLRB) continues, the unions continue to use questionable tactics in an attempt to unionize Boeing in South Carolina. The Daily Caller reported last week on some of the recent union activities in South Carolina. Workers in the new Boeing plant in South Carolina rejected the attempts of the International Association of Machinists (IAM) to unionize them, but the IAM representatives are still hanging around Charlestown. Union bosses have paid visits to the homes of Boeing workers to instruct them on the benefits of unionization. Workers have been told that if they form a union, the IAM will get the NLRB to drop its case against Boeing. “But if union organizers are indeed suggesting to South Carolina workers that unionizing could secure their jobs and dispense with the NLRB case, the IAM could be in serious trouble. Gowdy, who worked as a federal prosecutor before entering politics, told TheDC what the IAM is allegedly doing might be illegal. The crunch point of this ponzi scheme is about to be reached. That is why the unions are desperately trying to change to rules of unionization–to save face on their pension funds. If more members do not join quickly, the whole pension scheme will collapse.